31 Jul Lamb has been more expensive in US terms. Earlier in the week, we looked at lamb prices in deflated terms, and they are indeed near record highs. We know that export markets are helping drive lamb prices, so it’s worth assessing whether lamb importers are also forking out record dollars for lamb. When I started researching this article, I was sure that at some stage in the recent past there was an outlandish claim somewhere amongst the articles stating that lamb prices could get to $8. It took a while to find, but it was there (Read here). The forecast was, admittedly, not made with a lot of conviction, but the thinking behind it was basically the price of lamb in US dollar terms. 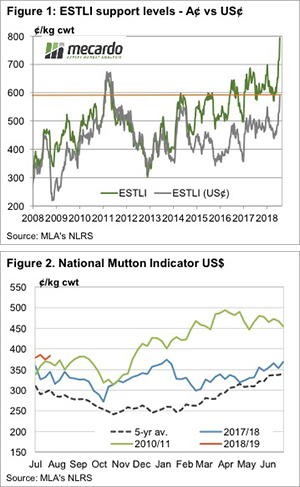 Even with the Eastern States Trade Lamb Indicator (ESTLI) sitting just shy of 800¢, in US terms the ESTLI still isn’t at a record (Figure 1). Back in 2011 when the Aussie dollar was at or around parity with the US dollar, the ESTLI in US terms was at 670¢/kg cwt. This week the ESTLI remains below this, at 588¢/kg. Lamb prices are not cheap in US terms, but they have been more expensive, albeit only for three months. The peak of lamb prices in US terms is still 14% away in nominal terms, and obviously further in real terms. If the exchange rate stays steady, and the ESTLI reaches 670¢ in US terms, it puts the ESTLI in AUD at 905¢/kg cwt. Those who study Meat and Livestock Australia’s (MLA) saleyard reports will have seen plenty of lambs making more than 900¢, so it’s possible the indicator could get there, although unlikely. For mutton, the upside seems to be stronger. Figure 2 shows the National Mutton Indicator (NMI) in US terms on a financial year on year basis. The current close to record mutton values are still 23% behind the record price in US terms set in autumn 2011. While the dry weather has seen lamb supply tighten, it is still seeing sheep coming to market and keeping a lid on mutton values, to an extent. Looking at lamb prices in US terms helps go some way to explain how strong prices can be at the moment. While lambs prices are extraordinary in our terms, they are ‘only’ 20% above the levels seen for most of 2017 for importers. This might be sustainable for the short term and the good news is that it makes prices of 600¢ seem cheap. There is still plenty of upside for mutton, especially when it rains. 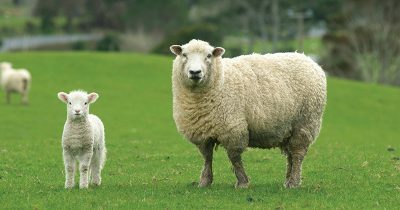 Strong lamb and wool prices are likely to see a real squeeze on the supply of older sheep over the coming years. Lamb prices in US terms are strong but have been higher back in 2011. There is still a 10% upside for lamb to reach the 2011 records in US terms. There is more upside for mutton prices than lamb, as it was 20% stronger in 2011 in US terms.